Here is my tapioca pudding post take two. Why am I bothering to attempt this post a second time? It's worth it, truly. I only post recipes here if they've passed through my family's rigorous testing! Besides, it's time for wrapping up in sweaters, adding a log to the fire, and digging in to a little comfort food. Food that nurtures the soul. Because the cravings for richer dishes coincides with holiday decadence and overindulging, I'm always looking for ways to mix in some healthier alternatives... especially in the sweets department. Cravings for something creamy have been haunting me for days, and I knew this tapioca pudding would hit the spot. It's not wrapped up in any childhood memories, in fact I had never even tasted tapioca until I was in my 20's. But it was an instant favorite. We used to make it at the vegan restaurant I worked at and although I'm not vegan anymore, I still prefer this non-dairy version. My kids do too! This week I made it with almond milk for the first time. Yum! Bring water to boil in a sauce pan. Whisk in tapioca and keep stirring for a few minutes to ensure that the pearls don't clump. Cook another 15 minutes, stirring occasionally. Whisk in sugar, milk and salt. Let cook for another 5-10 minutes. It will still be a bit soupy. Add splash of vanilla. Cool and pour into glass dish or mason jar to chill in the fridge. Serve with a dash of cinnamon and maybe some chopped almonds or coconut. All of those glistening little pearls make the texture the best part for us, but if you prefer something smoother perhaps you'd enjoy another one of our family staples: custard. Sweet and creamy aren't the only ways to spell comfort. I bet you have some favorites of your own, and I'd love to hear about what you cook or bake when a little food for the soul is in order... you know, the dishes that embody the word cozy for you. If you happen to have links to the recipe, please do share! THIS is my idea of comfort food! thank you! Oh I havn't eaten tapioca pudding for years! I love it! 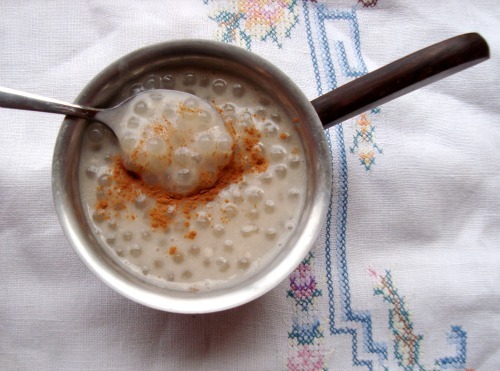 We LOVE tapioca pudding and the kids grew up on it for dessert. I always make the fluffy kind with beaten egg whites. The most recent comfort food I made (last night) was baked macaroni and cheese. Mmmm. :) I love tapioca pudding, despite the fact that my husband calls me an old lady every time it comes up. He's never even had it. Perhaps I'll try this out and let him know what he's missing out on. My grandmother used to make this for us, but I haven't had it since I was a kid. 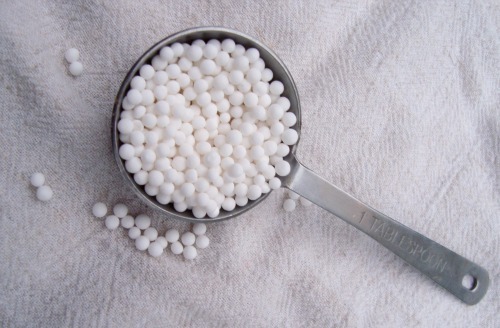 Just last week, I picked up a bag of tapioca pearls at the market, and then put them back. I'll buy them the next time I shop there. When it got chilly here, I bought all of the ingredients to make a good chili... but then it turned so hot (like 100 degrees!) that I haven't made it yet. Oh my gosh, my husband would love this! good golly, i haven't had tapioca since i was under ten! we've also been struck by the sweet and creamy bug, and have been dipping into rice pudding to bring smiles. i love sago too.. similar but smaller??? and you can do it lemon!! the lemon one is yummy too cold.